Oh, this album was great fun to make! I have never worked with children, so that was joy number one. Knowing that God gave me something good for them to sing brought me such satisfaction. My growing up time was so crooked and far from God’s perfect desire for me (although He is sovereign and this was all part of His plan!) that I think these songs were written for me as much as anyone else–as the saying goes, (who said it, I don’t know) ‘it’s never too late to have a happy childhood’ — and with God, that is the truth. We recorded my vocals in my former apartment in New Jersey, and the “2 plus 2” choir in my church fellowship room–it was all very elegant. :-) The sight of the girls in their headphones, stationed four feet apart, with one phone on one ear, and the other ear open so they could hear, looking like a young bunch of female Bee-Gees, is a memory I shall always treasure. Grant (my producer) and I are understanding each other better all the time, and this, our second project, was easier in that regard–we are improving our communication skills! As before, we prayed and laughed our way through it–I don’t think I cried as much this time! And, the joy of sound effects (!) and technology (well, that’s Grant’s joy!) and knowing that we were ‘allowed’ to have fun on this, gave us a great sense of freedom. The money did run out, as I was approaching the manufacturing part of the process. (You might think I am not a good business-woman, and you are correct to think so.) ‘God Is’ was entirely funded by gifts, but I didn’t feel right about asking for help that way this time. Perhaps it’s better said that He was not leading me that way. During prayer, truly God gave me the idea to ask people if they would buy their copies in advance. (“Commit thy works unto the Lord, and thy thoughts shall be established.”) The response was amazingly fast and complete. Some people did give gifts anyway, and God provided what was needed in about two weeks! Maybe I should just back up and say that I was NOT calm during the time when the money ran out, and I’m sure I did some of my customary crying during this time! But it was so clear Who’s idea it was, especially when it worked. I have already established that business is not my strong point. His strength is made perfect in our weakness. And you would be proud of me: (I was proud of myself!) going to Staples and buying my first receipt book which I am keeping as another memento. :-) The unused part, I mean. I really did use it. Thank you, my friends and brothers and sisters in the Lord. You have been so faithful and generous to me! I thank God for your love and your prayers. 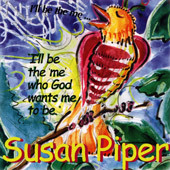 2006 brought many changes–I was back in Pennsylvania, and working on the next album which was Scripture put to music. My dear friend Martha (God Is: ‘Martha and Me’) went home to be with Jesus just before Christmas. She LOVED the children’s songs, and she did get to hear the finished CD before she died, and I was so glad. She was a bright and dear and very unique shining star for the Lord, and I do miss her. I’m so glad God recorded her voice for me, and for all of us.